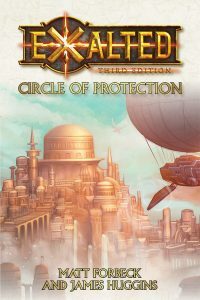 Today’s excerpt is Chapter 1 from Exalted: Circle of Protection. Palym gazed up at the massive metropolis growing from the ground before her as she and Xiao hiked closer to Great Forks. When they’d started out in the morning, she’d only been able to see the gilded roofs of its great temples shining in the first rays of dawn, but with every step they took closer, the city revealed a tiny bit more about itself. They had been walking for days on a road lined with shrines, hoping to see some glimpse of the city, knowing that it had to lie somewhere in the distance that yawned before them. To witness it now as they continued their long hike toward it so transfixed Palym that she found she often had to remind herself to breathe. “Have you ever seen anything so beautiful?” she asked. “You just have to stop picking your nose.” Palym grinned at her friend and waited for her to digest the insult. Then she scampered away, evading Xiao’s vengeful smack. Palym fled down the road toward Great Forks, laughing. She was eager to get closer to their goal, anyway. She was faster than Xiao and always had been, ever since they’d been in swaddling clothes together. It wasn’t that Xiao was particularly slow. Palym had just always had a gift for speed. No one else in their village had ever been able to catch her either — especially not since she’d reached her full and considerable height. When she’d announced to her family that she was leaving home, none of them had argued or even asked why. They’d long known she would not stay with them forever. Her mother had given her a hug, and her father had kissed her forehead. “Don’t forget us back here,” her father had said as he’d wiped a rare tear from his eye. Palym had not objected to her mother’s words, although she knew well that she had no plans to ever return. She told herself that she let her parents hold onto those words as a form of hope that might offer them some small consolation. Secretly, she clasped them to herself as well. But the sight of the grand city rising before her and Xiao scattered all those sentiments to the wind. The idea of living in such a large place, surrounded by so many new and interesting souls, thrilled Palym. “What’s the first thing you want to do when we get there?” she asked Xiao, perhaps a little too loudly. The other people they passed on the road stared at her as if she was an unruly child, but she ignored them. She was too excited to let the opinions of others bring her down. Many of the people in her village had gawked at her like that before, and she’d laughed them off. If they were too uptight to enjoy the world around them, she didn’t care. Despite that, Xiao shushed her, after finally catching up. “You draw too much attention to us,” she said, still puffing from the effort. “What’s wrong with that?” Palym said with a mischievous smile. But the city’s wide gates had grown much closer, and they drew her eyes away from Xiao. Palym glanced at the people nearby: an older couple strolling hand in hand, a mother carrying her baby in a bamboo pack on her back, a trio of farmers leading their well-laden oxcarts to market. None of them seemed like they would be a threat in a dark alley on a moonless night, much less on an open road in the middle of the day. Xiao groaned at her, but all the people around them laughed. There would be no death on the road today. Not for them. Palym decided to give Xiao a break. Xiao needed to catch her breath after all. She wasn’t built for running. They walked in silence until they reached the line that had formed before the city’s gates. Dozens of people stood there waiting on the rutted road, staring up at what little of the hilly metropolis they could see peeking over its high stone walls. “What’s the holdup?” Palym said as she craned her neck to peer further down the line. Xiao did her best to ignore this. She couldn’t manage that for long, Palym knew. “But we don’t have a cart,” Xiao said, protesting. Palym flashed a grateful smile at the farmer and hustled past him. Xiao dashed after her once more. The guards at the gate — who wore practical armor and carried businesslike blades — gave the two newcomers appraising glances. Xiao flinched away, unwilling to meet their gazes, but Palym looked the guards in their eyes in turn and gave them each a wide and easy smile. Most of them were too busy inspecting incoming carts to bother with the pair, but one of the guards — an older woman with weary eyes — lit up at the young woman’s grin. It broke the routine of her work and brightened an otherwise dreary day. She waved them both through with an appreciative smile of her own. Palym could see that the guard had seen countless people enter Great Forks for the first time. The fact that this still made her happy to witness, even in the mildest way, gave Palym hope. As Palym and Xiao emerged on the far side of the gate, Great Forks sprawled out before them, climbing the rise upon which it sat, to the central temples at the heart of the city. The two friends stood inside a large, open square lined by all sorts of shops and ringed with a long string of hawker stalls selling food of every kind, just the thing to welcome hungry travelers worn out from the road. As Xiao had complained, the place was filled with so many different scents mixed into an exotic mélange that Palym had never experienced before. Rather than disgust her, though, the smells set her mouth watering and made her want to skip from stall to stall, sampling the wares of each of the hawkers, even though she guessed that getting through them all would require a solid week of gluttonous dining. From the square, streets snaked off in three different directions in no apparent pattern, quickly winding out of sight. More people walked down each of them than lived in Palym’s entire village, and they came in an astonishing variety. Old and young, short and tall, in all kinds of colors of hair and skin. They dressed in everything from hempen rags to silken gowns, in styles she knew and in others that stole her breath away. Xiao lowered her eyes and blushed at the attention. “You are always so… you,” she said in some strange mixture of resignation and admiration. Xiao began to answer but realized Palym was giggling at her. “I’d rather you were a tray of dumplings,” she said as she rubbed her empty belly. When they were done, the sun was already riding lower in the sky, and the tall buildings cast the western sides of the streets in shadows. Their hunger sated, they set out to find a place to stay for the night, working their way deeper into the city. “Why don’t we just take a room in one of the inns near the gate?” Xiao said. She was worried about getting lost in such a large place. A massive explosion cut her off. It was so powerful that the ground beneath their feet trembled with the force of it. The cornices of nearby buildings crumbled, and pieces of them tumbled into the streets below. Then the screaming began. A thick column of smoke arose in the distance, a black smudge spiraling into the blue of the sky.